4 February 2016, at 12:00a.m. EU - Since the start of the year, EU sow prices have generally been stable. In fact, for the key German market, this stability has been apparent since the end of November, although the average M1 sow price has been at a low level of 95¢/kg. This is the lowest price recorded since the dioxin crisis of January 2011. With the pound weakening against the euro during this period, the sterling value of the German sow price has increased from below 67p/kg to 72.5p/kg in the latest week. This has reportedly led to some strengthening of GB sow prices, although they too remain at a low level by historic standards. As is usually the case, the German price set the tone for other Member States, with most recording a generally steady price either side of the holiday period. Having held up better over the summer, the French price declined more than the German one in the autumn before it stabilised. In contrast, the Dutch price held up better, barring a short-lived drop in November. 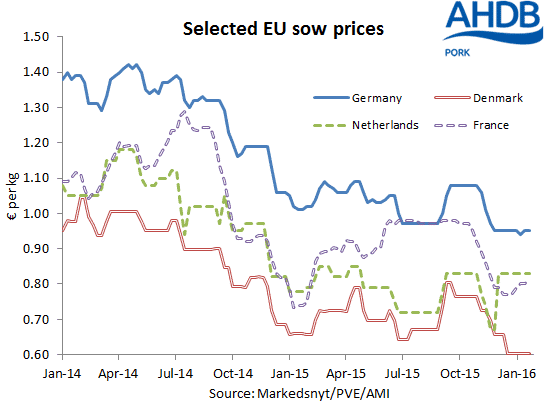 These price developments come despite the likelihood that sow slaughterings have been relatively high, due to the difficult financial position of many EU producers. So far, census figures from three EU Member States, Germany, France and Poland, all show declining breeding herds during 2015, with a particularly sharp fall of 15 per cent in Poland. As well as indicating possible tighter supplies of finished pigs ahead, which could eventually lead to better prices for both clean pigs and sows, this suggests that demand for sow meat is firm. Therefore, if cullings do slow down, there is potentially some scope for sow prices to rise, even without a recovery in the finished pig price.